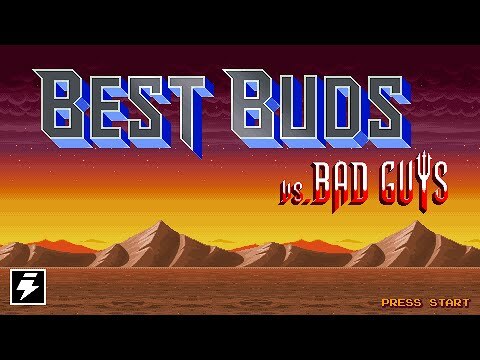 Buy Best Buds vs. Bad Guys and get the games download now! Team up and battle the foul creations of Doctor Jushaan’s twisted genius. Travel to 11 different worlds, all presented in classic 16-bit style, with a catchy chip-tune soundtrack and lots of over-the-top weapons! A varied and imaginative arcade platformer, full of blasting action and a whole lot of exploring to uncover secrets and hidden areas! Discover special power-ups such as tanks, skateboards, mine carts, TNT, giant-buds, mini-buds, banana napalm, donuts of death and many more! Equip insanely powerful, silly, and just plain deadly weapons to defeat the evil army and gain access to new areas. Equip shrink-rays, lasers, ice-cream blasters, buzzsaw guns, homing missiles, and more! Gigantic evil bosses and over 100 varied enemies to fight, many fresh from the imagination of an eleven year-old boy. 11 different worlds, pixelated in 16-bit Arcade machine style, with plenty of modern touches including detailed background animation, multi-layered parallax, weather and special effects. Replay the game with a whole new level of challenge in REPLAY+ mode. Since this is a Super Icon game, there are plenty of references to classic games, such as Ghosts ’n Goblins, Green Beret, Bionic Commando, Black Tiger, and loads more!